This is for those who want to play a Blues for the first time. It starts simply with the bass notes, then the chords follow, and finally we get some licks and a solo. It is a sort of “Blues in a nutshell”, because it contains many things which are explained more in detail on other pages here. It simplifies some things a bit, but this makes it easier to understand. This version is in the style of Eric Clapton on his Unplugged album, but you should rather learn and play around with some Blues basics using this song as a background jam track and not try to copy it note for note. Try to train your ear from the very beginning, find out as much as possible by listening, not reading tabs. 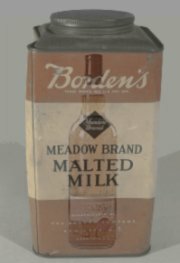 Why Malted Milk? What is it? It’s hard to find a good description what Blues exactly is. The origins go back to the former African slaves in the South of the United States, especially the Mississippi Delta, singing and playing spirituals, plantation songs, praise songs or field hollers. They tried to play their songs on instruments of the western hemisphere, particular on the guitar and developed a new kind of music. This music has a formal repititive call-and-response structure (otherwise singing in groups on the cotton fields would have been impossible) and uses so called “blue notes” to express a very special mood, often described as something like “Blues is a good man feelin’ bad“. Jazz, Rock, Pop, Folk, Country – all these are more or less heavily influenced by the Blues. Instead of the E7 chord you can also use a simple E or E5 chord, only the B7 should be a 7th chord. Don’t care about these details in the beginning. So you need only three simple chords (E,A,B7) to play a Blues (see above)! At first listen to the song and the bass notes. Try to find out the bars and the chord changes. You can also tap your feet, clap your hand or grumble boom, boom or “one, two , three, four”. Got it? The first bar on the 4th beat ends with “…milk”, than you hear the “quick” change from E7 to A7. Try to go through the song this way and locate where in the 12 bar scheme you are. You have 4 beats per bar, if you just count up you should end with 4 x 12 = 48 beats in 12 bars. Next step: take your guitar (acoustic or electric, it doesn’t matter), locate the bass E string (the thickest string) and pick it with your thumb (or a pick if you need it) when the 1st verse starts (I keep drinking…). Try to get the rhythm. You can play a steady, even rhythm (count “one and two and…” or a shuffle rhythm (like the one on “Before You Accuse Me”), both fit. When you reach the 2nd bar, you have to change to the next bass string, the A string. With a steady, even bass you pick 4 times for each bar, using shuffle it’s 8 times. Then you go back and continue with E and then A until you reach the 9th bar. Now you need your left hand (if you play right-handed and pick the string with your right hand) to press down the A string at the 2nd fret. Pick the string, it’s the note B, the bass note of the B7 chord. 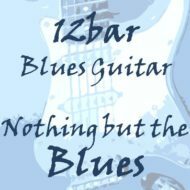 You are now able to play bass to every 12 bar Blues in E.
You may hear that the A string bass note doesn’t fit as good as the other notes in this song. You’re right, but it’s still OK. We’ll see later, why. Another way is to play the bass note using only one string, the bass E string. The advantage of this way is that you see how many frets (or semitones!) are between the notes. Start like the one above, but when it comes to the second bar, don’t pick the A string, but press down the E string at the 5 th fret and pick. If you have tuned your guitar the old fashioned way you know it already – you’ve picked the A note. Compare it by picking the E string at the 5th fret while picking the A string also, they sound equal. If not, tune your guitar! Now you know that you need to go 5 semitones up for the second chord. If you have reached the 9th bar, you can get the B note at the 7th bar of the E string. It’s the same note as the 2nd bar of the A string (5+2=7). So you know that for the third chord, B7, you have to go 7 semitones up. That’s all. If you play a Blues in A, use the A string in the same way. Easy! So far we didn’t need notation or tablature. For the next step you have to read the chapter about how to read tablature. A tablature is a simple way to write down the notes played on a string instrument. The six lines are the strings of your guitar from the high E (first line) to the low E string (6th line). The number is the fret where you have to press the string down. Sometimes the tab is divided by a I, between two I’s you have one bar. If you know already how to play the chords E, A and B (or even better B7) you can strum the chords instead of just picking the bass notes. You can either use a pick and use slow downstrokes or play fingerstyle and pick each string with one finger, bass string with the thumb. If you can’t play chords, this is a good time to start with. Get a chord book with recommended fingerings and start slowly. which sounds better, especially in the 9th and 10th bar, where you walk down back to the E chord. The / means to slide the finger from the 3rd to the 4th fret while still pressing down the string. Look at the rhythm page for more riffs and variations. Using the same notes we can also get some new turnarounds elsewhere on the fretboard – just to have some if we need one. A turnaround is very popular in Blues music, it’s a riff or chord progression at the end of a section (for example the first 12 bars) leading to the next section (the next 12 bars). Usually it ends with the dominant 7th chord, B7 in this case. But it’s easier to identify a turnaround by ear than to describe it using music theory. The next step requires more time, because there are several new things to learn. At first we need some theory, if you want to understand which notes can be played in a solo, in other words: we have to learn a scale. As mentioned before, this is a short course, for more details look at the specific pages here on 12bar.de. The other thing is of a more practical nature: we need some Blues specific playing techniques, which are vibrato, slide and string bending. Let’s start with the theory. You may have heard about scales before or even learned the C major scale at school, but for the Blues we need something different: a pentatonic scale. The good thing is that it is easier than the (so called diatonic) 7 tone major scale, because it contains only 5 notes. The bad thing is that it is only an attempt to describe the Blues which classical music theory, because some things don’t seem to be logical that way. At first: what is a scale good for? Simply said, it contains all the “allowed” notes of a song. Even without knowing anything about music theory you will hear if someone plays (or sings!) wrong – if he plays a note which does not belong to the right scale. The hard way to find out which notes are allowed is to play them all and listen. Others have done this before and found some interesting things about it – there are general rules which can be used for every song. This is not the only position (pattern) to play it, because we have six strings with each more than 12 frets (or semitones, 12 semitones are called octave, but that’s another story – see basics). After 5 notes you reach the E note again, just one octave higher (D-string, 2nd fret) and continue octave for octave repeating the same intervals. Play the high and low E-string and the D-string at the 2nd fret together – it’s all E.
This is pretty much confusing when you start playing. However, you should try to learn the first two or three patterns of the minor pentatonic in the beginning, later all of them. Don’t panic, we’ll go through it note for note. At first we need to know some special tab signs: the b and rb, the ~~~ and the /. Let’s start with the /, that’s a slide. 4/6 means that you press down the string at the 4th fret, pick it and then move the finger (which is still pressing the string down!) to the 6th fret. In this case take the middle finger, so you can proceed with the next notes. The next one we have to learn is a bit more difficult – 7b(8) means a string bending. Use the ring finger to press down the string at the 7th fret and pick the string. Then start bending the string to the lower E string. Use index and middle finger to support the bending. You’ll hear that the tone pitch (the “height” of the tone) will rise, because the string now has a higher tension. The tricky thing is that you have to stop if you reach the pitch of the semitone above (or in general the number of the fret in parentheses, here 8), so you have a semitone bend (for the Blues purists: it sounds even better if you stay a bit “under” that note). You can’t learn that in one day, but it’s worth the work. If you release the bending without picking again you have a release bend – yes, that’s the rb on the tab. The last thing is the 5~~, which means you have to play a vibrato. A vibrato is simply a variation in pitch of a note, in most cases less than a semitone. On the guitar there are many way to achieve this, the principle is always the same: you increase and relax the string tension. The simplest way you should start with is to bend the string and then release again several times (as always, more on these techniques can be found here at 12bar.de on the techniques page). In principle you are now able to play the solo, but you don’t understand why the notes are used and how to add your own ideas. So we’re going to analyze it now. Compare it with the E scale image above. We start with 4/6 on the G string, that’s a full-tone slide from the minor pentatonic scale note B to the major pentatonic scale note Db. This is already one of the main principles for advanced soloing if you need more notes than the minor pentatonic scale provides: take a note from the major pentatonic scale from time to time, listen how it works. Hear the difference by sliding into the D note (from the minor pentatonic, one fret above) instead. The next note is the root note E, we’ll come back to this one often, at the end of this first lick, too. We now have a special bend – from a major note (Gb) into a minor note (G), it sounds as if the melody tries to escape without success in both directions (Db, too), so we end up with the root note E again, this time a bit longer, so we put a vibrato on it. It starts like the one before, just two frets higher, followed by a variation of the initial chromatic lick: we bend the B string at the 8th fret followed by the note we’ve bend towards without reaching it. Finally, we have another chromatic run which ends up with the B7 chord (the V), fitting perfectly into the 12 bar structure: we resolve the tension the chord builds up by starting the next verse. By the way – the chromatic run at the end is also a perfect Robert Johnson style intro! In the end we have a short lick with all techniques involved – slide, bends and vibrato. We also have a new one called snapping: just lift the string, pull it away from the fretboard and let it snap back on the fretboard instead of just picking it. We end with the root note E, followed by the E chord. There’s one thing left we have to discuss: in the beginning I wrote that the open A bass string doesn’t sound that well. The reason is that it is not played as bass note for the A chord, instead it’s the note at the 4th fret. It’s a C# (or Db) which belongs to the A major chord as well. The sound is a bit different, however, you can play the open A string, too.